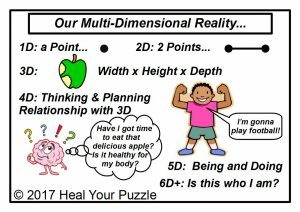 Heal Your Puzzle » Blog Archive » We Live in a Multi-Dimensional Reality… What does that mean? We Live in a Multi-Dimensional Reality… What does that mean? What are ‘Dimensions’? Dimensions refer to how much information is needed to describe something. The most simple form is a Point; this is 1 dimensional. A 2D form is like a line drawn on a flat piece of paper and 3D has depth eg. a physical object like an apple. Theoretical Maths already says multiple dimensions are possible but what does that mean in our ‘Real World’? What are the other Dimensions?